My third (and last) day to riding north along the west coast, retracing a route I took in the opposite direction almost 20 years ago. The goal was to get within easy riding distance of the Par-Tay, which I would be riding to the next day. Starting from Coos Bay (actually North Bend), OR, that meant riding to Aberdeen, WA. This was a readily attainable 300 miles away but that distance could be increased if I elected to take a couple of detours to hug the coast on some of the peninsulas instead of taking US101’s shortcut across the base of them. Since I was up late writing up the previous day’s blog post, I didn’t exactly jump out of bed at 7am. A quick look at the weather found it to be overcast (big surprise), chilly, and misting (really just the coastal fog). I went back to bed in hopes that another hour would improve conditions a bit. I finally pointed the Nightowl down the road around 10:30am (somewhere, my friend Dennis is rolling his eyes). When I rode CA1 just north of the San Francisco Bay Area, the coastal mountains were a constant presence and very close to the coastline. As you work your way north, they move inland a bit and become less of a constant. By the time you get to central Oregon, the coastal mountains are lower and less consistent. As a result, the road doesn’t curve around as much and you end up making better time. 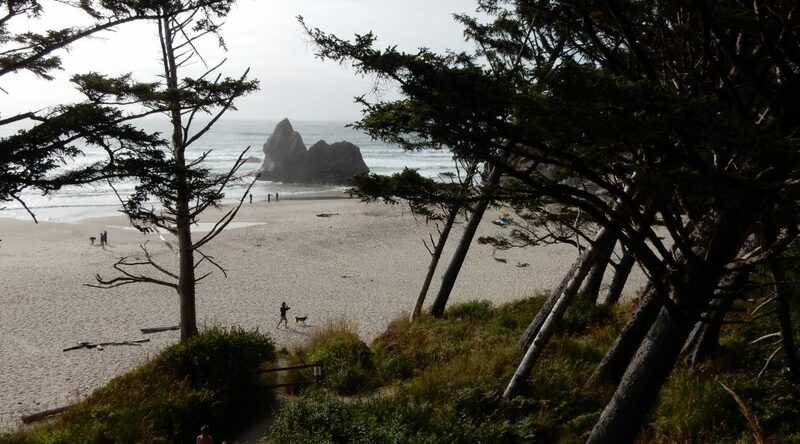 Another byproduct of the change in landscape is that the Oregon and Washington coastlines have more beach and fewer cliffs and rock formations. Trust me, there’s still plenty to behold. One other change as you travel north is that the coast becomes more populated and developed. The Northern California coast is still fairly remote and undeveloped. As you reach the mid-Oregon coast, things start to get crowded. From a motorcycling standpoint, here’s where you start to see serious congestion in the towns. I would actually have sun and brighter colors in my photos. I could turn down the grip and seat heat on the Nightowl. With the sun out, I paused north of Florence, OR to take a few photos. Usually, the sun means more warmth and less temptation on my part to break out my Gerbing jacket liner. Today that was not the case. There was a strong wind coming off the ocean; a chilly humid wind that made it feel quite a bit colder than what the Nightowl’s temperature sensor was telling me. The area around the Heceta Head Lighthouse State Park offers some of the most scenic coastline views in Oregon (in my opinion). In the park itself, you have the eponymous lighthouse and caretaker’s residence, their meticulously maintained white paint standing in out in stark contrast from the lush greenery surrounding it. Much like I did during my ride in 1999, I stopped at the beach below the Heceta Head Lighthouse to walk around and take a few photos. Unlike that trip, which was rather foggy, the extra sunlight afforded some better photographic opportunities (check the gallery at the end). I reached Newport, OR just about the time my stomach started reminding me that I’d skipped breakfast. The ride through Newport was interesting to me since this is where my 1999 southbound ride along the coast started here. I looked for the 50s-themed diner I’d eaten at back then but couldn’t find it. I did, however, find the town much more developed and congested as hell. There were two lights that had lines of vehicles long enough that it took two stoplight cycles for me to get through. As I was stopped at yet another stoplight, my eyes, which were scanning for lunch venues, lit upon the following: Pig ‘n’ Pancake. Seeing as I have a horrible sweet tooth and have no compunctions about eating sweet carb-laden fare at any time of the day, I ducked out of the death march towards the next stoplight and found a parking spot. After being seated, I asked the helpful waitress for a mug of hot chocolate to try and warm up a bit. When the mug arrived, the whipped cream over the hot chocolate was piled higher than the mug was tall. If this wouldn’t give me a proper sugar rush (and subsequent food coma; foreshadowing? ), nothing would. Just to make things worse, I ended up having two of these. While agonizing over lunch selections, the helpful waitress noted that there was a crepe combo that wasn’t on the menu which would include two eggs and a selected meat in addition to the aforementioned crepes. I requested strawberry crepes, scrambled eggs, and bacon. If you find yourself cringing at this reckless act of caloric suicide, I can only say: I’m on vacation, dammit! The remainder of the ride north along the Oregon coast became a little tedious. 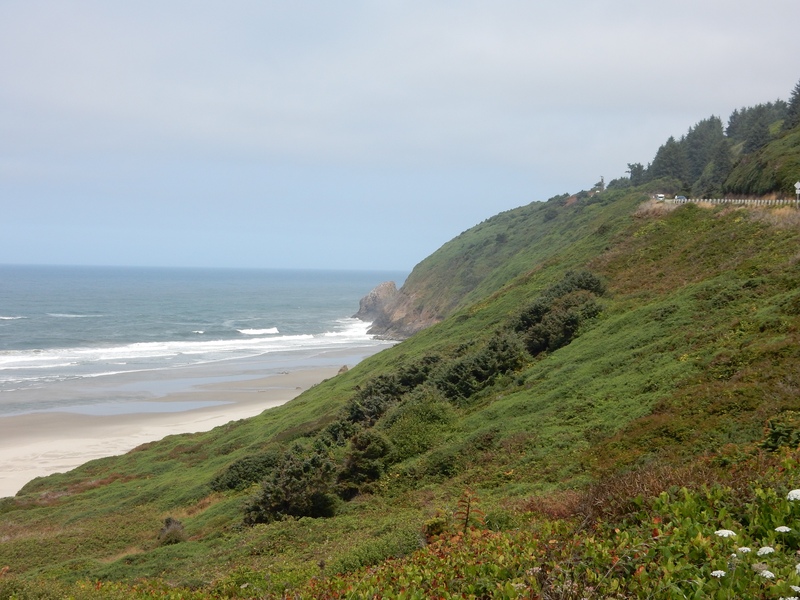 The towns got more congested and US101 spent less and less time in sight of the coast. It was still an interesting ride, but it wasn’t the veritable festival of spectacular views that I’d enjoyed for much of the previous day and a half. Still, I did get a few nice photos from a rise north of the Nehalem River and a few more nice photos at Arcadia Beach State Park. These occasional climbs over a wooded highland provided some curves to exercise the Nightowl a bit, but the additional congestion meant they were often traversed slowly from behind a line of cars. Bummer. As I mentioned earlier, there was a fairly strong wind coming off the Pacific for much of the day. When you’re riding in forested surroundings with hills to break up the wind, it’s not much of a factor. When, however, you’re in a big open area suspended a couple hundred feet in the air, the wind can provide a challenge. This is what happened when I crossed the bridge at Astoria, OR, which spans the mouth of the Columbia River and connects Oregon to Washington. Most of the bridge is down low near the water. On the Washington side, it rises on metal truss spans high enough to allow most pleasure craft to navigate below it. On the Oregon side, it rises high enough on steel arches that ocean-going freighters can cross beneath it. With all this buildup, you may think I nearly rode the Nightowl over the edge of the bridge to certain death. Sorry to disappoint you, but it really wasn’t that bad. The wind was strong, but consistent, so it wasn’t hard to compensate to keep the Nightowl tracking straight. If the winds had been gusting, there probably would have been more adventure to relate. Once in Washington, US101 initially spends some time on the banks of the Columbia River, which is wide enough at that point to look like an ocean. Then it doubles back inland and doesn’t spend much time on the Pacific coast. It does wind along a few harbors and tidal sloughs, but even these can be marginally interesting if you happen to ride by during low tide. Still, there are points of interest. The woods themselves are dark and dense with conifers, making is seem perfectly feasible that a family of seven-foot hairy man-apes has been living in them unnoticed for hundreds of years. I also enjoyed the ride through South Bend, which claimed to be the oyster capitol of the world. By this time, the sun was almost set when I pulled into Aberdeen. A quick stop at a gas station parking lot gave me an opportunity to find a local room for the night. At this point, I was too chilled to consider pitching a tent. Besides, I was sure I was going to be living out of the tent for the subsequent two nights (at least). I’m so glad I got back out here to ride the coast. If you’re at all serious about motorcycle touring, this needs to be on your bucket list. If you have time and don’t mind wrestling with the San Francisco and Los Angeles metro-messes, I’d strongly suggest adding the southern half of CA1 to your route. If you don’t have time to do it all, and you want to avoid big cities, the coast from the Bay Area north to Newport, OR is a really good ride. While it’s not described here, I also did the Olympic Peninsula on another trip and it’s worthwhile as well. The coast from the Aberdeen, WA south to Newport, OR is nice but, in my opinion, isn’t required riding. Having said that, if the additional time to ride that stretch isn’t a factor, by all means, do it. A look south along the coast north of Florence, OR. A look north along the coast north of Florence, OR. Sea lions cover the coastal rocks south of Heceta Head Lighthouse State Park. 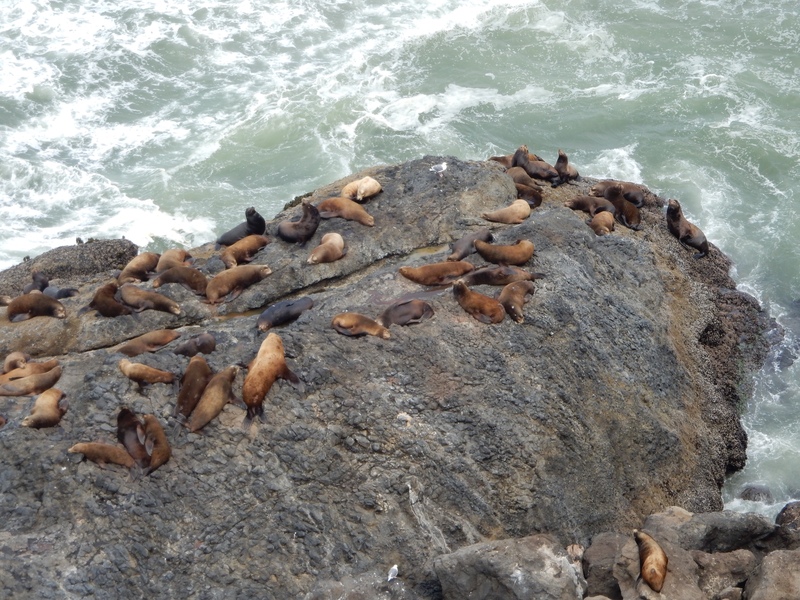 A closer look at the sea lions covering the coastal rocks south of Heceta Head Lighthouse State Park. A group of sea lions on the coastal rocks south of Heceta Head Lighthouse State Park. A closeup of sea lions on the coastal rocks south of Heceta Head Lighthouse State Park. A distant look at the Heceta Head lighthouse. A distant look at the Heceta Head lighthouse and caretaker residence. A distant look at the Heceta Head lighthouse caretaker’s residence. A poor shot of a US Coast Guard chopper heading south along the coast in a hurry. 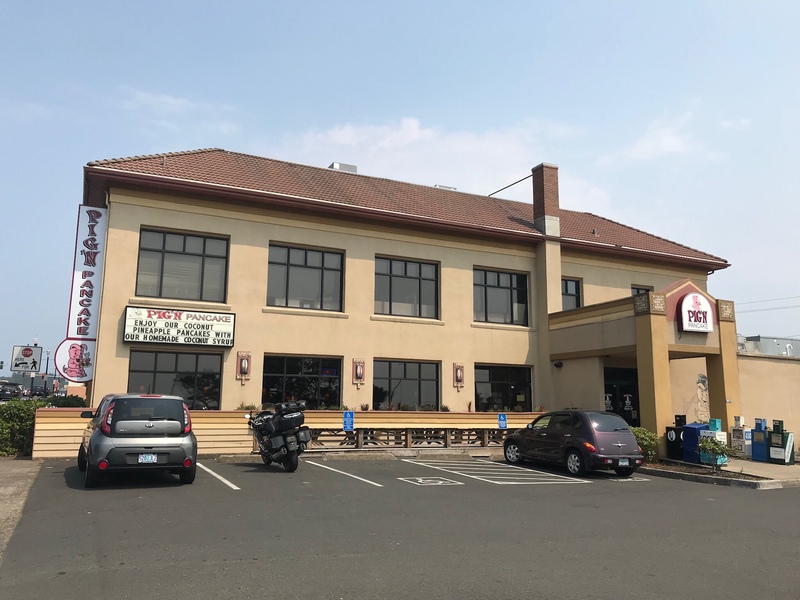 My lunch venue in Newport, OR: the Pig ‘n’ Pancake. Being chilled, I ordered hot chocolate. 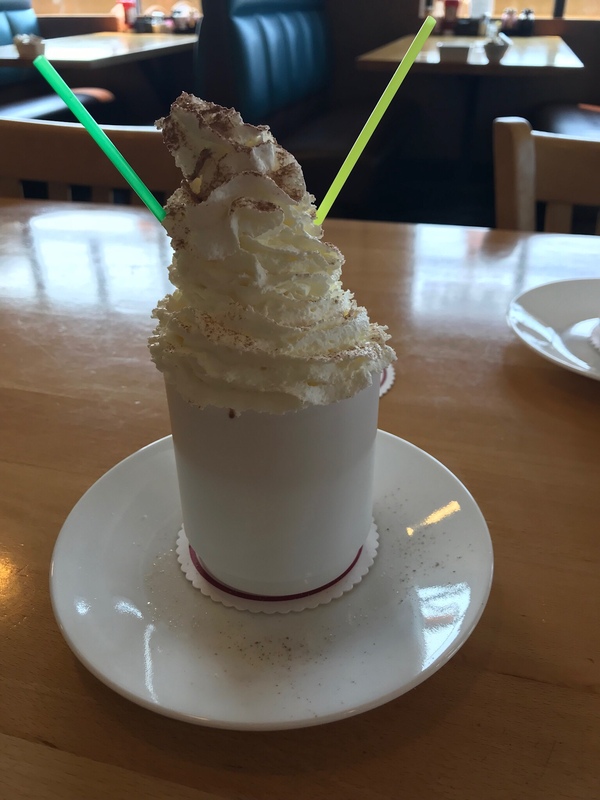 I think the whipped cream was piled higher than the cup holding the hot chocolate. My Pig ‘n’ Pancake lunch combo of strawberry crepes, scrambled eggs, and bacon. A distant look at the Heceta Head lighthouse caretaker’s residence from the nearby beach. 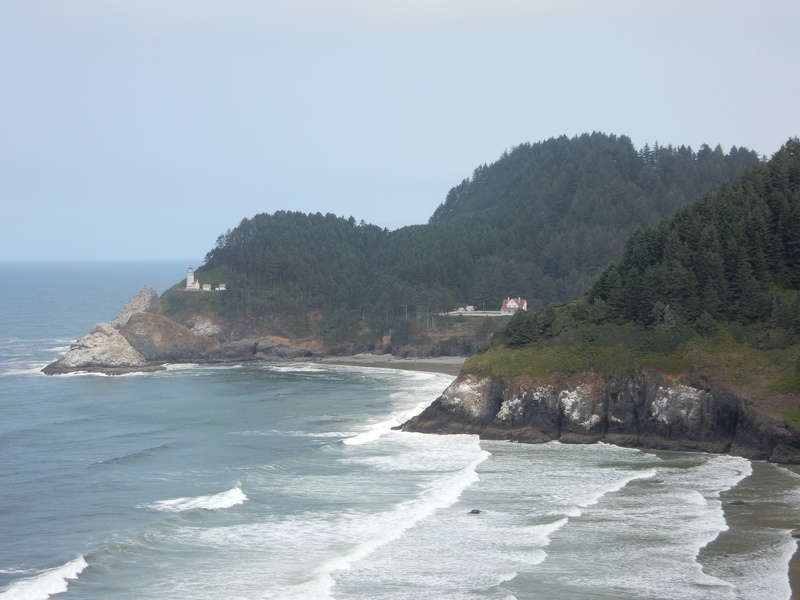 A view of the Heceta Head lighthouse and caretaker’s residence from the nearby beach. A view of the Heceta Head lighthouse from the nearby beach. The US101 bridge over Cape Creek just south of the Heceta Head lighthouse. A view south along the coast from an overlook at Winema Lake. A view of the coast from an overlook at Winema Lake. A wide view looking south from the south end of Oswald West State Park. 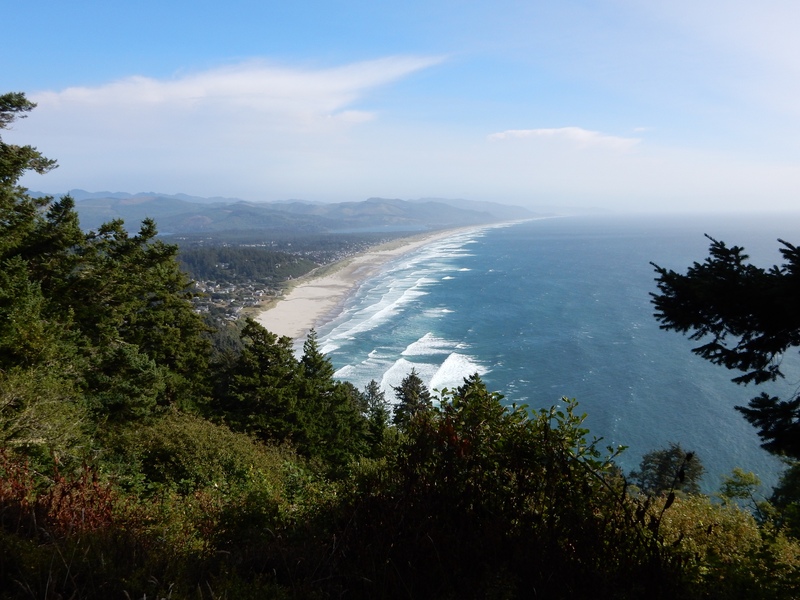 A view of the mouth of the Nehalem River from the south end of Oswald West State Park. The Nightowl at the south end of Oswald West State Park. A view of the rocks at the north end of Arcadia Beach State Park. A closer view of the rocks at the north end of Arcadia Beach State Park. A view of the coastline south of Arcadia Beach State Park. A path overlooking the beach at Arcadia Beach State Park. A wide view of Astoria, OR and the mouth of the Columbia River, taken from the Washington shore. 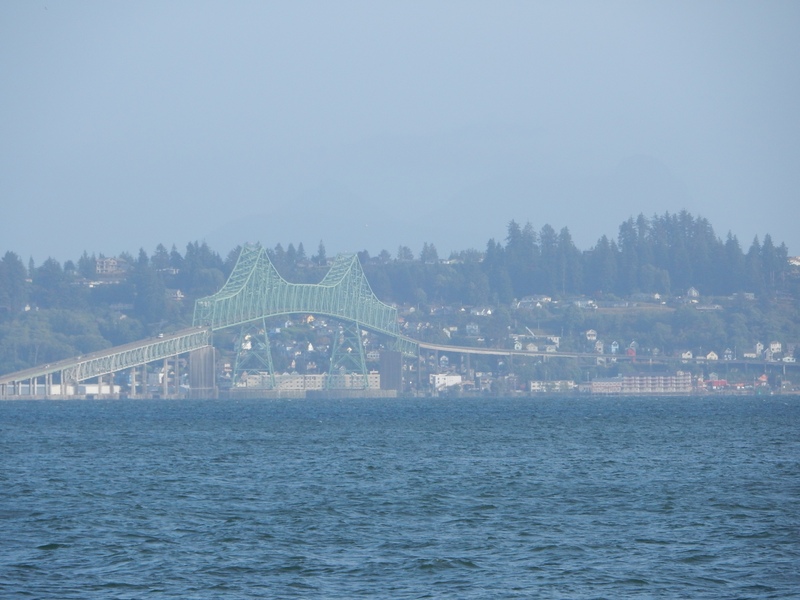 A view of the bridge at Astoria, OR, taken from the Washington shore.